Haslemere, with a modest population of about 15,000, is extremely fortunate to possess such a building as Haslemere Hall. It is a fully equipped theatre seating approximately 340 in a main Auditorium with upper Balcony. The large stage has facilities for flying scenery and there is a modern computer controlled lighting and sound system. There are ample backstage dressing rooms, Green Room etc. As a multipurpose building it is also used for lectures, meetings etc. There are regular cinema showings of current films, and there is a licensed bar. This was all made possible by a local benefactor by the name of Barclay Lewis Day , who was living in Haslemere back in 1912. He decided to build a Hall with his own money, and he invited well known architects to submit their plans in a competition for the best design. The competition was judged by a prominent member of the Royal Institute of British Architects, and the winning design was by Annesley Brownrigg F.R.I.B.A. A firm of architects bearing his name still practices in Guildford to this day. The early 1900s saw the tail end of the William Morris , and Arts and Crafts Movement in England , and the design reflects this influence. There is a particularly fine curved stone staircase leading to the upper Rotunda sitting out area, and Balcony. 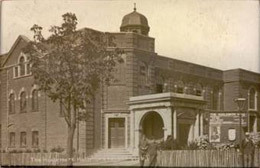 Building work started in 1912 and the Hall was officially opened in January 1914. 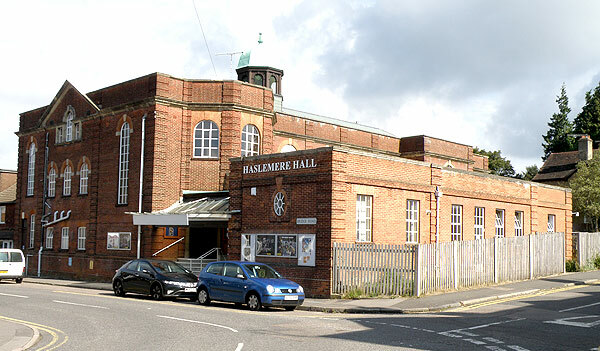 The opening coincided with the outbreak of World War I and for the first four years of its life the Hall was requisitioned by the War Office and used as drill hall for the troops. Barclay Lewis Day died in 1913, his daughter Edith gifted the hall to the town (as her father had intended) in 1919. Edith was a trustee from 1913 and chairman from 1920 to 1960 , she died in 1981, aged 96, and was considered Haslemere’s greatest benefactor ever. A plaque at the base of the staircase commemorates this most generous gift. The Hall has been run completely independently by a Board Of Trustees set up originally by the then Ministry Of Education. The Trustees are representative of the Civil, Religious, and Educational life of the town and its various performing Societies. The Hall receives no endowments or State Grants. Until recently its only source of income came from lettings to those who want to use the Hall and from individual “Friends of Haslemere Hall”. There is a small Annual Grant from the Local Authority but in recent years this been cut back. However, with the demise of the Rex cinema in Haslemere, the Trustees decided to introduce film shows in conjunction with Southern Cinema Services, on several days each month. All the latest releases are shown and the income from this activity has been of enormous help in ensuring the Hall’s continuing viability. A building that is over 100 years of age is constantly requiring attention in the form of repairs and renewals. Improvements and modernisation work are undertaken as funds permit. To this end the “Friends of Haslemere Hall” has been set up to which all those who wish to contribute as subscribers, may do so. The Trustees are always mindful of their responsibility and obligation to maintain the Hall, and of their debt to Barclay Lewis and Edith Day who provided such a valuable amenity for the future generations of Haslemere citizens.